Urban life has many advantages, but it also comes with some downsides. Air quality is a growing concern in modern society, which holds especially true for city dwellers. You may already have an air purifying system installed in your home, but what about your car? We spend large chunks of our time driving from point A to point B and the air quality during that time is just as important as air quality in your home. Enter car air purifiers. A range of products designed to make the air you breathe while driving, healthier. The air in your car is just as affected by pollution as the air outside is. To make matters worse, car air quality is also affected by particles and chemicals that come from the car itself, so investing in a car air purifier might not be a bad idea. There is a wide variety of products using different technologies to make the air in your vehicle healthier by removing allergens, odors and other chemical particles. Some of the most popular technologies include ionization, filtration and ozone generation. How can you tell which one will work best for you and your car? There is an overwhelming amount of options out there so choosing the right product can be tricky. We have compiled a list of the best products out there, giving you the chance to pick the product that will most suit your lifestyle. Most car air purifiers are very easy to use and require little to no maintenance. Depending on your preference you can opt for a unit that uses HEPA filtration or an ionizing unit. The products based on filtration seem to work faster and get better results, although they do represent a bigger initial investment and require some maintenance. The ionizers on the market are smaller and less expensive and they work by emitting negative ions which bind to harmful particles and make them stick to surfaces instead of floating in the air. The downside of this system is that you might have to clean your car surfaces more often, as they will get covered in dust. 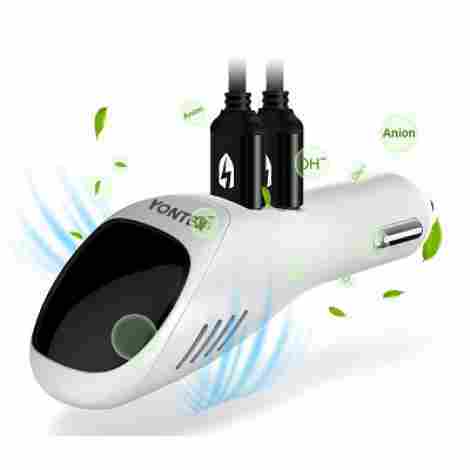 This small and easy to use car air purifier makes use of ionizing technology to get rid of particles like allergens and pollutants. It works fast and creates a healthier breathing environment even when you’re stuck in traffic. In addition to making the air you breathe healthier it also removes any unpleasant odours lingering in your car. This unit emits a large amount of negative ions that bind to harmful particles in the air. This makes them stick to the surface instead of floating in the air, making the air you breathe cleaner. In addition to making the air cleaner, this product also serves as a charger. It has two USB ports, so you can charge your phone or tablet on the go. When it comes to price-performance, you get the most bang for your buck with the Valiry. Since it doubles as a charger, you’re getting two products for the price of one. This product uses a filtration system based on the HEPA and HESA technologies. Its three stage filtering process works very well to eliminate harmful particles. Its advanced technology enables this product to get rid of 99% of allergens, pollen, dust, bacteria, pet hair and odours. It has two different speed settings, making it more adjustable to different circumstances. This unique technology is particularly good at getting rid of tobacco smoke residue, being about three times more effective than products using ionizing technology. A system for sensing the density of air particles enables this product to assess the air quality in the car. Different colour lights indicate whether the air quality is excellent, fair or poor. This product is very pricey compared to the products using ionizing technology, but it also promises to deliver better results. New filters need to be purchased from time to time, which increases the overall cost. This product is a small and stylish looking unit which uses negative ions to rid your car of pollutants and unpleasant odours. It emits a high number of negative ions as well as safe levels of ozone to keep the air in your car fresher and healthier. You simply plug it into the cigarette lighter and it works until plugged out. 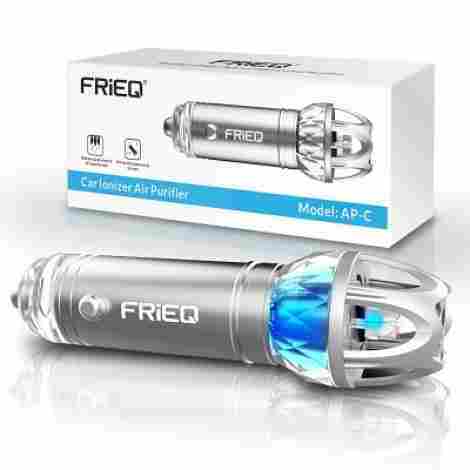 By emitting a concentration of 4.8 million anions per cm3 the FRiEQ does a good job fighting harmful particles floating in the air. It effectively reduces pollutant particles in your car. 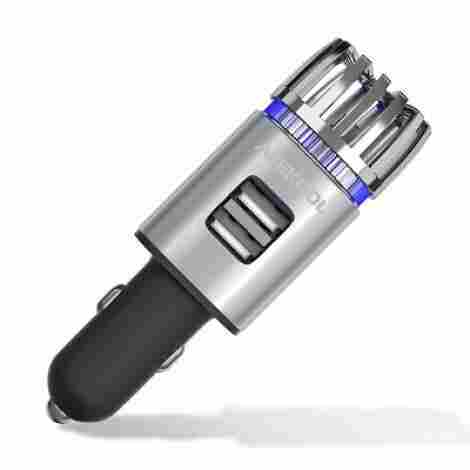 This product is one of the smallest and most stylish looking car air purifiers in the market. When plugged in its LED gives off a calming, pleasant light. As far as ionizers go, you will definitely get the most for your money with this product. Its competitive price coupled with its efficiency makes it quite the bargain. This product uses advanced HEVA filtration, which works in three stages to remove pollutants, pollen, dust mites and unpleasant odours. Activated carbon works to remove 99% of formaldehyde within one hour, leaving your car air much fresher in a very short time. It has a system for indicating air quality, so you can adjust you can adjust your usage accordingly. This unit can be used in your car, indoors and even outdoors. It is lightweight and easy to use which makes it easy to bring it with you to use in any situation. The filters in this unit need to be replaced every 6 to 9 months, depending on the frequency of use. This means the maintenance cost is lower than with most filtration units. Although this product is pricier than the ionizers and needs some degree of maintenance, it delivers great results, making the initial investment worthwhile. 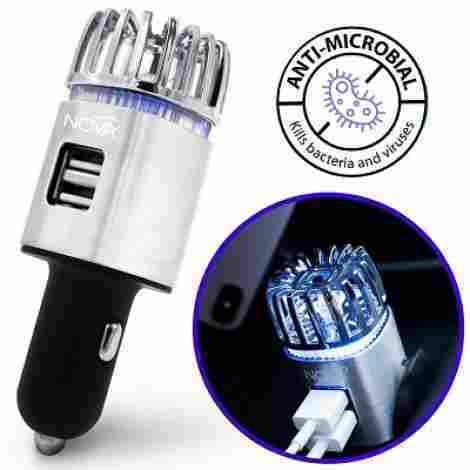 This sleek-looking purifying device produces a huge number of negative ions which help clear the air in your vehicle of cigarette smoke, pet dander and other often harmful airborne bacteria. This is especially important if you spend a lot of time in your car commuting and are exposed to off-gassing from your vehicle. This product features two charging ports on top of the device. They both charge at 2.4 amps. One of the charging ports, however, is 2.4 amp with Quick Charge 3.0. Simply put, this particular port will charge your devices faster. Unlike a lot of other similar products on the market, this product doesn't require any filters to operate. This saves you money in the long run as you aren't required to purchase anything further once you own the device. This handy device is one of the more affordable options on our top ten list. 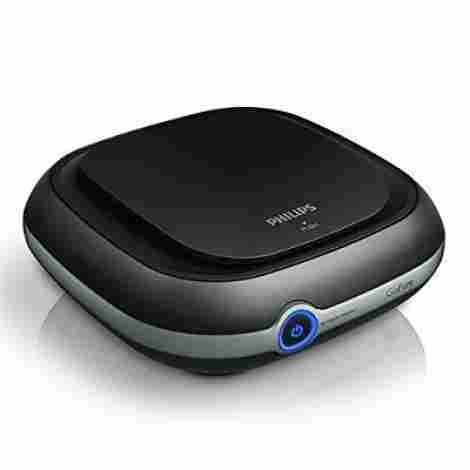 It provides a lot of value, not only in its air purifying skills, but also because it doubles as a dual USB charger. The Nova 2-In-1 uses not only ionization, but ozone emitting technology as well, so it battles air pollution in two effective ways. This ensures that it gets rid of harmful particles as well as any unpleasant odours by generating safe levels of ozone. It works in an antimicrobial way and keeps your cabin cleaner and fresher. The Nova 2-In-1 emits as many as 5.6 million negative ions per cm3, which ensures it deals with harmful particles in a very effective way. It does its job well even in heavily polluted areas. This product generates safe levels of ozone to remove any unpleasant smells. The ozone interacts with odour causing chemicals in a way that renders them odourless. This works well for most bad smells. This product ensures high quality performance without making a dent in your bank account. It is affordable and effective. In addition the company offers a 1 year warranty. This small and convenient unit gets rid of bad odours and improves air quality by neutralising harmful particles using ionization technology. It effectively battles cigarette, food and pet smells. By emitting a large number of negative ions it gets rid of contaminants such as mold, bacteria and viruses, leaving your car with fresher and healthier air. The Lightsmax 2018 is a very small unit that you simply plug into the cigarette lighter outlet of your car and you don’t have to worry about it anymore. It doesn’t require any maintenance. Emitting a large amount of negative ions is proven to be one of the best technologies out there for battling harmful and allergy causing particles. This small unit emits a powerful amount of negative ions. Compared to similar products, this option comes at a very affordable price without sacrificing efficiency. The quality of the product is comparable to higher priced models, giving it an advantage on the market. Instead of emitting ions, this product makes the air in your car fresher by filtering out harmful particles. It works by trapping the pollutants, effectively getting rid of allergens, dust particles and bad odours. It filters air using natural substances, removing the need for a power outlet. It is a natural, safe solution for poor air quality. The activated bamboo charcoal fights pollutants is a natural way. The carbon in the bamboo fibres binds to harmful particles, filtering out bacteria, dust particles and unpleasant smells. This product contains no chemicals or toxins. It does not give off any fragrance to cover up the smells. Instead it filters out the offending odours, leaving the car smelling fresh. The effects of this product are long lasting, despite the fact that it doesn’t need a power outlet. One bag lasts for over a year, with the price per bag being very affordable. This product works as an ionizer and an ozone emitter, getting rid of harmful particles and unpleasant smells via two different pathways. Because of its double action it is a good choice for drivers with allergies and passengers that are more sensitive, like babies and the elderly. It is easy to use and requires no maintenance. The combination of producing high numbers of negative ions and emitting safe levels of ozone works really well to ensure cleaner air in the cabin. It works especially well for allergens like pollen and dust. This product is certified by the Federal Communications Commision as well as the Restriction of Hazardous Substances, which assures the customer of its high quality and of the company’s consideration for the consumer. The cost of this product is comparable to other similar products. The Acekool also comes with a one year warranty, which assures the customer of its quality. This product works by emitting negative ions into the air, neutralizing and purifying the positively charged air inside the car. The high concentration of anions aids in certain physiological processes in the body, like vitamin storage and synthesis. 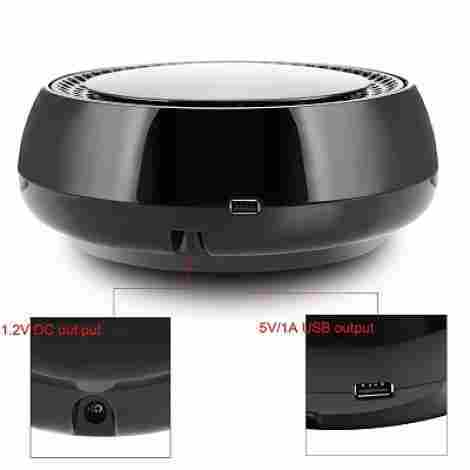 It is simple to use and it comes with two USB ports, so you can use it to charge your devices. This purifier can also be used outside the car, as it comes with its own power adapter. It works well in small rooms, desktops and closets. The Thinkga is very effective at removing allergens, like dust, pollen, smoke and mold spores. It is ideal for anyone suffering from asthma, pollen allergies or mold sensitivity. Compared to products with similar technology this one is a bit on the pricey side. It makes up for the higher price by being portable, which means you can use it indoors as well. Which product will work best for you depends on your needs and the environment you live in. 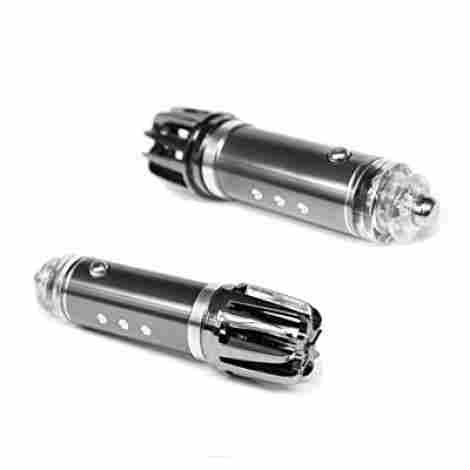 If you’re simply looking to get rid of that persistent tobacco smell in your car, ionizers might be the way to go. For the more sensitive customer who is struggling with asthma or allergies, investing in a HEPA system might be a smart decision. Pollution is becoming a bigger and bigger health risk, so taking steps to minimize the negative effects of bad air quality is a must. Investing in a car air purifier is an easy, reliable way to reduce breathing in pollutants and other harmful particles while driving. Different car air purifiers tackle the issue of harmful particles in different ways. The two most common technologies used are the HEPA filtration system and the ion emitting system. When deciding which product will suit your needs best, it’s good to know how the product will go about doing its job. Ionizers tend to be simpler to use, less expensive and require no maintenance. They work wonders for unpleasant odours, such as cigarette smell, animal smells and leftover food odours, but seem to be less effective when it comes to getting rid of allergens. On the other hand products that use the filtration systems represent more of an initial investment, but work better for dust mites and other particles that cause allergic reactions. They also tend to get results quicker. In addition to ionizers and HEPA systems, some products also use ozone generation to tackle bad smells. Instead or in addition to emitting negative ions, some units emit low levels of ozone, which bind to odour producing chemicals to neutralise them. The price range of car air purifiers is very broad, which makes it difficult to know which products are overpriced and which ones provide you with cleaner air at an affordable price. This is why we have included products from both ends of the spectrum that get the job done. The HEPA systems are generally on the more costly side, as they promise results in a matter of hours and pride themselves in tackling allergens much better than ionizers. In addition to being more pricey, they also need their filters replaced every now and then, which adds to the cost. Most ionizers on the market are available for a substantially lower price, but still get the job done. Regardless of your budget, we are sure this list includes a product that will meet your needs without putting too much strain on your bank account. Dealing with technology that isn’t intuitive to use can be very frustrating, so it is very important the product you are purchasing is easy to use. Most car air purifiers are pretty straightforward, requiring only the 12V cigarette lighter in your car in order to work. Simply plug it in, and it starts doing its job. MOst work immediately after being plugged in, while others have an On/Off button. The fact that the product is working is usually indicated by a small LED light and a quiet humming sound. Some of the more technically advanced and bulkier car air purifiers take a bit more time for installation, as they need to be mounted on the dashboard or behind the driver’s seat. A lot of car air purifiers come with an adapter, which enables you to use them outside the car as well. While some car air purifiers require nothing more than to simply plug them and forget about them, others require a bit of maintenance every now and then. The units utilizing the HEPA filtration system will need to have their filters changed every now and then to keep them working optimally. Most of them comes equipped with a filter indicator, which means a light will turn on to let you know it’s time to get a new filter. Ionizers don’t require any maintenance, although since they cause the harmful particles to stick to the surface, your car might need cleaning a bit more often than you’re probably used to. The units that require filters to be changed generally have a longer lifespan compared to the ionizers. It’s always nice to have the feeling you’re getting a bonus when purchasing a product. Some car air purifiers come with extra features such as additional USB ports, so you can charge your device while using them.This is especially handy for the units that work by plugging them into the cigarette lighter in your car, as this way the USB ports are in a very handy position. The HEPA filtration units will often have an indicator for air quality in your car, which is definitely a nifty feature to have.This enables you to adjust your usage to the air quality and it gives you an idea of which factors influence the air quality in your car the most. Some car air purifiers are portable, meaning you can take them out of your car and use elsewhere. The portable units work well in closets, small rooms or even in shoes to get rid of any unpleasant smells. They tend to work best in small rooms, as their compact size means they probably won’t be strong enough to effectively clean the air in bigger rooms. The portable units come with adapters, which enable you to plug them into your regular socket. Even though performance is more important than style in this type of product, it doesn’t hurt to have an attractive looking device in your car. After all you are more likely to use a product if you find it visually appealing. For the minimalistic customer, the smaller, inconspicuous units will have an edge over the bulkier, flashy looking ones. Ionizers tend to be smaller, and once plugged in they are hardly noticeable. If you’re looking for a fashion accessory for your car, some products, especially the HEPA filtration systems pride themselves for their futuristic, stylish look. The blue LED light that shows the product is working adds a nice calming vibe to your car. Products coming with a warranty from the manufacturer will always have an edge over the ones that don’t. Being assured that your product will get replaced, if it does not meet your standards and that you will receive your money back if you’re not satisfied, lends a sense of confidence of the manufacturer in its product. It lowers the risk involved in purchasing a product and allows the customer to change his mind if it turns out the product doesn’t meet their needs. This is an important issue that we have taking into account while compiling the top 10 list. Whether or not the product does its job well is irrelevant if it breaks down within the first week of using it. This is why the quality of materials and how well the product is made is very important, especially when it comes to products that involve technology. In some cases, paying a bit more guarantees a product of a higher quality, while other products are well made despite their affordable price. To prevent you from falling for expensive and ineffective, or cheap and poorly made products, the lifespan of the product plays an important role in our ranking system. Q: What is the difference between HEPA filtration systems and ion emitting car air purifiers? HEPA devices use a filtration system that traps harmful particles, dust mites, mold spores and chemicals causing bad odours inside the filter located in the device. They use fans to guide the air though the filter, leaving the air free of pollutants. Ionizers don’t use a filter or a fan. They work by emitting a large number of negative ions or anions into the air. These ions then bind to positively charged harmful particles in the air like pollen or dust which causes them to stick to surfaces instead of floating in the air. Q: How do ozone generators work? Instead of filtering air, they generate ozone in low, safe levels. Ozone interacts with chemicals responsible for bad odours in such a way that it makes them odourless. This works quite well for a number of different odours, including long lasting, lingering smells, like tobacco, pet smells and food odours. Since ozone generation works well for bad smells, but doesn’t get rid of harmful particles in an effective way, most units that generate ozone also use an additional technology (like filters or ions) to tackle pollutant particles. Q: I suffer from occasional asthma issues. Are car air purifiers suitable for me? Which product would work best in my situation? Yes, car air purifiers are suitable for people suffering from asthma or allergies. Although most car air purifiers promise to remove allergen particles from the car cabin, the HEPA filtration system seems to work best when it comes to reducing allergies and asthma symptoms. They tend to work fast and remove 99% of the offending particles within the first hour. Q: Do they give off a perfumed smell? No. Most units simply remove particles that cause bad odours without using any chemicals or perfumes. Their action leaves the car smell neutral, without using heavy perfume to cover up bad smells. Ozone generators sometimes give off a fait smell, but it is not a heavily perfumed smell. Q: I smoke in my car on a daily basis. I have been using air fresheners, but they don’t help with the problem. Will a purifier help with the smell? Most car air purifiers get rid of harmful particles as well as unpleasant odours. Tobacco smell is one of the most common smells customers are looking to get rid of. Both the ionizers and the HEPA filtration units do a great job at getting rid of tobacco smell. Q: Do they all have fans? No. Products that utilize ionizing technology don’t use fans, as their function is merely to emit a high concentration of negative ions, as opposed to filtering air. This contributes to them being more quiet than the products which use fans to work. Q: Are there any health risks that come with ozone generators? The ozone levels generated by car air purifiers that utilize this technology are very low and are considered to be safe. If you are worried about exposure to ozone, perhaps opt for a product that does not emit ozone, but tackles bad smells and pollutants in a different way, such as ionization or HEPA filtration. Q: How do I know the product is working? Some car air purifiers are very quiet so it’s sometimes hard to know if they’re working or not. Most come equipped with a LED light, which turns on when the product is plugged in. Q: How often do I need to replace the filters in HEPA systems? It depends greatly on how much time you spend driving, how often you use it and which setting you use it on. It also depends on the product itself. Both the Phillips GoPure Compact 200 and the Homdox generally need a new filter every 6 months, if you are using it approximately five hours a day. Q: Can the LED light be turned off? As the light is an indicator that the unit is working, it cannot be turned off. If the light is too bright, some customers recommend you turn the product in such a way that the light is facing downward. 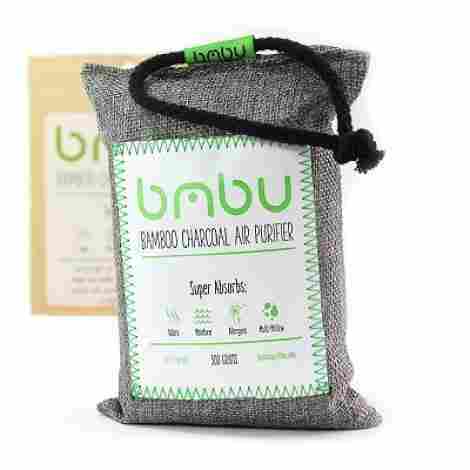 Q: What is inside the Bmbu Bamboo Charcoal Deodorizer? The bag contains pure bamboo charcoal, with no additives or filters. Q: Are car air purifiers noisy? 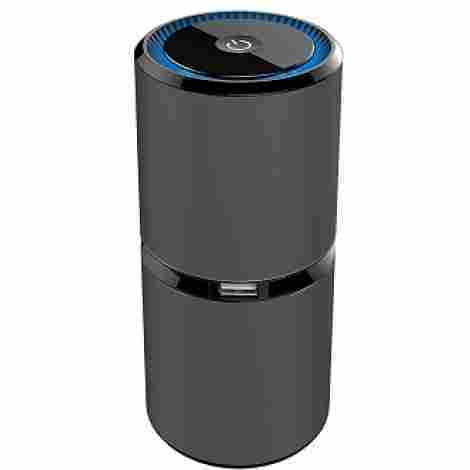 While none of the devices are completely silent, they are generally not noisy. They may produce a low, humming sound, that you hardly notice. In most cases, you can’t hear them at all once the car is running or the radio is on. Q: Will the car air purifiers drain the car battery if they are left plugged in? They will not, as they are only working and using up energy when the car is running. Q: What’s the difference between car air fresheners and car air purifiers? Air fresheners usually work by giving off perfume into the car cabin. The pleasant smell of the perfume merely covers up any unpleasant odour, while it does nothing for pollutants and other harmful particles. Car air purifiers actually remove particles like pollutants, allergens and dust mites. They also get rid of bad smells using technology instead of simply covering the smell up. Mist Healthy Air – Have you ever thought about the air you’re breathing?